For a very long time now, I have seen multiple noobs (and even some non-noobs ) asking what spam is. So I've decided to write a dissertation on the topic to help everyone out. The wonderful topic of.. SPAM! ^^An example of spam OUTSIDE the can and uncut. 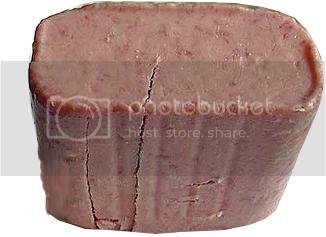 ^^A picture of spam INSIDE the can, away from human eyes . ^^There is an example of a one-way conversation. It is considered spam. All one-way conversations (even if they could technically fit the rules and guide-lines of certain threads) should be done by Private Messaging. We have been having a lot of problems with one-way spamming as of late. ^^Here is an example of a one smiley spam post . ^^Here is an example of a one word spam post. 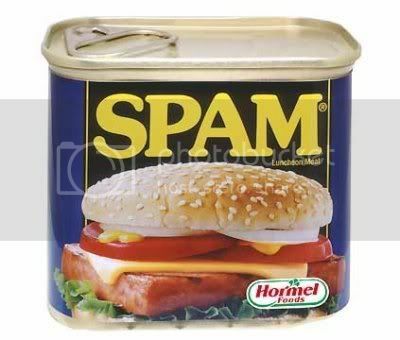 SPAM, SPAM, SPAM, SPAM, SPAM, SPAM, SPAM, SPAM, SPAM, SPAM, SPAM!!!!!!!!!!!!!!!!! And now I will post funny, random smilies no one ever uses. ^^And finally, here is an example of a spam post with multiple different smileys and the word 'spam' written over and over again. As you can see, there are many ways to spam. WHY is spam so bad? Spam is bad for multiple reasons. The first reason is that it clogs message boards with meaningless chat- multiple posts that mean nothing. Another reason is that it ups people's post counts when they really haven't posted anything worthwhile, and that's not fair to the rest of the members who DON'T spam. Spamming makes more work for the moderators and administrators- it takes a lot of time and effort to go through entire threads to delete spam. I've witnessed first hand what spam does to a board- it RUINS it. You go into threads and find a bunch of nonsense instead of meaningful discussion. A board full of spam turns off decent would-be-members and attracts spammers in their place. Eventually, a board full of spam deteriorates so much that is either ceases to exist, or becomes so horrible that all the good members leave. Some people spam just to run their post counts up, but a high post count full of spam isn't worth anything at all . Also, when the admins and mods delete your spam, it disappears from your post count, and nothing is accomplished. Lots of people spam to make more money, but what they don't understand is that spam doesn't make them money. When people only post one or two words, all that happens is their POST count goes up, but they don't gain any more jack. You get paid for posts according to how many characters you use. Therefore, when you do a post with only one word, you make next to NO money. Basically, the bigger you make your posts, the more money you get. When you spam, you make next to nothing, if you make anything at all . If you see spam, report it to a moderator or an admin. If you feel you simply HAVE to spam, make sure you ONLY do it in Hillingdale Haven, and PLEASE, do it in moderation, however I suggest that you refrain from spamming whenever possible. Disclaimer: All examples used in this spam sticky were found in Hillingdale Haven and the crazy Padded Room . I am not pointing fingers at anyone, just using their examples as illustrations . Last edited by Iron and Light on Thu Feb 12, 2009 7:35 pm, edited 8 times in total. I feel like all eyes are on me cus I just did that one smiley thing yesterday. I admit it: I'm guilty!!! Now I understand the horribleness of spam and now recant of my former ways and have a fresh new aspect with a bright future filled without spam. Haha, I'm glad my thread helped you see the errors of your ways . In all honesty though, I didn't make it to point fingers . I'm not blaming anyone- just wanted to let everyone know what spam is. Some of you have been doing it unknowingly. What about one word one smiley posts? I think you get the picture . Now stop being a smart alec . Thank you IAL for that illustration. I admit that I have spamed before, but I like to think that I have matured since then. Thanks for this! Wouldn't spamming also be considered excessive posting rapidly without rest? For example, posting in every Hillingdale thread you haven't answered within one minute. That's another excellent eample, Birdie! Thanks! HH is still subject to spam rules, though not always in the same way. Posting just to see your name down the "last post in this thread" list in a forum, including Hillingdale Haven, is still a form of spam and continues to be discourged. A: others are not posting therefore as I post slowly I am the last one to respond to every thread. B: I'm posting fairly fast, but I actually do have something of substance to say. If a post is funny or has humor in it, I count that as substance, as well as posts of a serious nature. As a rule of thumb I avoid posting in any HH topic that has no real substance more than twice in a day. To do more than that would be spamming and having a 2 or 3 way conversation, plus raising my post count in a false way. An example of such a topic would be the Count to a Billion thread, and the Word association thread. Rarely is there the opportunity to make a humorous post in those threads, nevermind be serious. Of course, it's Hillingdale Haven, and basically I'd say HH is for having a fun time, and for very limited spamming (because I count the Count to a Billion thread as spam). If you want to seriously spam, and see your name at the end of every thread in the list,... well, there's a place called the Padded Room! random smilies that no one uses!